I wanted to sit down and write a short post about James Joyce, T.S. Eliot and a hippopotamus. Sounds easy enough, right? But one thing led to another and somehow, at the end of two hours, I found myself busy trying to find out who called Tolstoy a "great moralizing infant," all thoughts of Joyce or Eliot forgotten. It was time well spent, though, as I did read a ton of interesting stuff and I'm going to share some of it with you here (including, yes, who called Tolstoy such apt names). Here then is my wild hippopotamus chase across the internet and the reading list that resulted from it. 1. Where it all started: The Letters of T.S. Eliot, vol. 1. TSE used to say that the only evidence that James Joyce had read anything of his, was that one day in Paris the novelist told him that he had been, presumably with his children, to the Jardin des Plantes, and had paid his respects to 'your friend the hippopotamus'. Can you spell "adorable literary history anecdote"? I mean T.S. Eliot definitely keeping track of whether Joyce had read his stuff or not, Joyce with his kids visiting the menagerie, Joyce telling Eliot he saw his "friend the hippopotamus" - there is not one aspect of this that I don't find adorable. So of course I was then off to read Eliot's poem, The Hippopotamus. It is fairly well known that Eliot got all weird and religious as he got older. This poem (which you can read at Rap Genius, along with some helpful annotations) is from before that period and fairly unfriendly to the Church, though, I think, not to religion as a whole. Eliot borrows the form of the poem (and its hero, the hippo) from a piece by Théophile Gautier. But something very interesting happens as the poem goes along. Gautier had set up the image of the solid, peaceful and impervious hippopotamus in his poem to compare the man of firm belief - himself - to it in the last stanza ("I am like the hippopotamus:/ Swathed in my conviction,/ protected by strong and inviolable armor,/ fearlessly I cross the desert. "- translation from Rap Genius). 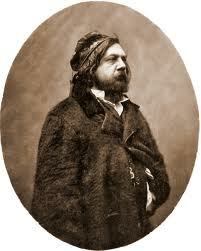 This is Théophile Gautier, by the way. He does kind of look like he'd laugh and stare you down while "bullets bounc[e] off his hide," doesn't he? Tell me he doesn't look like Hagrid. Now, Eliot's hippopotamus is also a symbol of man, but that's because he's vulnerable, helpless, prone to err, because "although he seems so firm to us/ He is merely flesh and blood." Who is strong, thick-skinned and set in their ways in Eliot's take? The Church. The poem is basically a list of comparisons between the hippo in his muddy swamp and the Church, and the hippo comes out looking vulnerable and human. It's so bad it's good. I mean, at one point Eliot manages to compare the Church's union with Christ to hippopotamuses mating, and that really tells you everything you need to know about this poem. At the end any pretense at subtler satire is dropped and we're just told directly that the hippo went to heaven and the Church to the swamp. Apparently a lot of smart people hate this poem, but you shouldn't let that stop you. It's silly and outrageous and not very good in the end, but do read it for the "I can't believe he just went there." factor if nothing else. And if you find yourselves with a thirst for knowledge and a bit of time on your hands, here's a pretty good scholarly paper on it as well. Google Scholar is your friend on the literary hippopotamus chase. And while I was on Google Scholar trying to figure out, as per usual, what the heck Eliot's epigraphs mean (and, as per usual, they're actually pretty smart and important - read that paper! ), I fell down another rabbit hole. In my mental categories, Donald Davidson inhabits two important sets: "great philosophers of language" and "people who wrote cogently about James Joyce." So seeing that he referenced Eliot's Hippopotamus in a paper about metaphor, I jumped at the chance to read it. The bad news is that I am pretty sure he misread Eliot. There is just no way to make sense of the poem if you take the hippopotamus to stand for the Church and not as a point of contrast to it. The good news is that this is otherwise a great paper. The even better news is that it is written in a pretty clean, clear style, so you can follow it even if you haven't read this type of philosophy before and it has a good chance of whetting your appetite for more philosophy of language. The problem here is basically how metaphors work. Do they work by conveying a second, metaphorical meaning besides their literal meaning? Like, for "all the world's a stage", the metaphorical meaning would be something like "the world is like a stage" or "the world shares features a, b, c, d with a stage." Davidson argues against this position. He argues that metaphors don't depend on a precise metaphorical meaning that is being conveyed, but on their capacity to trigger an act of interpretation in the listener. Taken at face value, a metaphor says something jarring (often because it's false or absurd), forcing the listener to notice something, to consider connections they wouldn't have otherwise. What we attempt in "paraphrasing" a metaphor cannot be to give its meaning, for that lies on the surface; rather we attempt to evoke what the metaphor brings to our attention. (...) But there is no limit to what a metaphor calls to our attention, and much of what we are caused to notice is not propositional in character. When we try to say what a metaphor "means," we soon realize there is no end to what we want to mention. How many facts or propositions are conveyed by a photograph? None, an infinity, or one great unstatable fact? Bad question. A picture is not worth a thousand words, or any other number. Words are the wrong currency to exchange for a picture. One of the examples Davidson uses in his paper is that of someone calling Tolstoy a "great moralizing infant." It's a striking phrase and it lends itself to pretty humorous footnotes (see below), but I was mostly curious to find out who the "famous critic" who came up with it was. When he met Berthold Auerbach in Dresden, that not too profound moralist told him that music is an irresponsible enjoyment, and added that irresponsible enjoyment is the first step toward immorality. Tolstoy, in his journal, made this clever and abominable phrase his own. His hatred and fear of music had the same moral and social basis as his hatred and fear of Shakespeare. We are told that at the sound of music he grew pale and his face became drawn with an expression very like horror. Notwithstanding, he was never able to live without music. In his earlier years he even founded a musical society. Before beginning work he habitually seated himself at the piano - that means a good deal. And in Moscow, when he sat beside Tchaikovsky and listened to the composer's Quartet in D major, he began to sob at the andante, before everybody. No, unmusical he was not. Music loved him, even though he, great moralizing infant that he was, felt that he ought not to return her love. So there you have it, folks. This is where chasing a fictional hippopotamus led me this weekend. I hope you'll find something nice to read in this list as well. Thank you for this post! I find there is often no logical way to organize any particular series of interesting thoughts I may have, but your hippopotamus chase has done just that-I especially enjoyed Davidson's thoughts on metaphor, it does mess with the more familiar "all the world's a stage" type definition I had understood. I am glad you enjoyed it :) There's a lot of interesting stuff on metaphors. My only contact with it before Davidson was with people who just mentioned in passing that their theories have this or that consequence in debates about metaphor, but I was always too lazy to see exactly what those debates were. If you're interested in the topic, this page on Stanford Encyclopedia is a pretty thorough summary. (The link goes to the section about Davidson.) I especially like how he summarizes the similarities between jokes and metaphors and how they're on a continuum with the way we normally use language. "Metaphors and jokes are alike in being small-scale works of verbal art. It takes wit to make jokes and a sense of humor to get them; it takes genius of a certain sort to make metaphors and taste of a certain sort to get them. All four capacities just mentioned are creative capacities, modes of inventiveness—inventive construction in the case of wit and genius, inventive construal in the case of humor and taste. The acquisition of these capacities isn't simply a matter of assimilating rules, nor is their exercise simply a matter of applying rules. But capacities that are in this sense creative or inventive are already at work in literal construal, even if they don't have such fancy names."